Attach the "metal tab bracket" to the back of the caddy with the two screws provided. This is what the metal tab bracket should look like when attached to the caddy. Insert hard drive or SSD into caddy. SATA connector first. Secure hard drive or SSD to the underside of the caddy with the four drive screws provided. 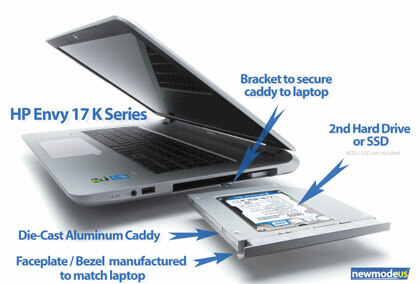 Turn laptop over and remove the screw that holds the CD/DVD Optical drive in place. Pull CD/DVD Optical drive out from drive bay. Secure caddy with screw at the bottom of laptop.